Fitness tracking giant Jawbone today introduced its next generation of activity trackers, the clip-on UP MOVE and the wrist-worn UP3 band. The Jawbone UP MOVE ($49.99) is intended to be the company’s entry-level fitness tracking device. It’s designed to count your steps, distance, calories burned, time spent engaging in physical activity and its intensity level. You can also track your sleep if you wear the tracker with an optional silicone wrist strap ($14.99, available in slim and standard widths). The UP MOVE device itself is made of nylon-like anodized aluminum and comes in five different colors. Press down on the UP MOVE’s face to reveal an LED screen, powered by a watch battery, which tells time and shows your progress toward daily goals. You can also check your stats and track meals using the Jawbone app, which syncs to the tracker by Bluetooth. MOVE is splash resistant – you can wear it in the rain, but not while swimming. The Jawbone UP3 wristband ($179.99), meanwhile, is a powerful device aimed at fitness enthusiasts who want more in-depth data. It contains a 3-axis accelerometer, bioimpedance sensors and skin and ambient temperature sensors. This allows the UP3 to track your resting heart rate and capture detailed sleep stage information. It’s even smart enough to automatically identify different sport activities, allowing the tracker to differentiate between running, lifting weights, practicing yoga and more. The UP MOVE is available for pre-order at Jawbone.com starting today, and will arrive in stores later this month. 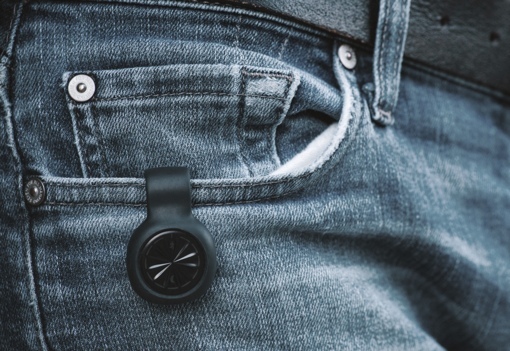 The Jawbone UP3 will be available online at Jawbone.com and in stores later this year in a black color, with more colors coming next year. Accompanying apps will be available for free from the Apple App Store for iOS and on Google Play for Android. You can learn more about the new Jawbone devices by visiting the company’s website. Before you make a purchase, be sure to check out our hands-on look at Jawbone competitor Fitbit’s new Charge, Charge HR and Surge devices. You might also want to compare the MOVE again out these 5 fitness trackers for $50 or less.